Larissa Another Day: Would You Like A Tie? No, my shop is not opening yet. Sigh. However in the mean time I have come up with a couple of ideas. FIRST Lets do a giveaway of two Little Man Ties. SECOND I have decided that I am going to take custom orders until my shop opens. I mean really where does it say that I have to wait until I get a mass amount of ties in a mass amount of varieties all sewn before I can start making them available to you. The answer is NOWHERE! I am offering one of my readers two ties. first entry- leave a comment telling me which two patterns you would choose, and where your little man would wear them. third and fourth entry- put in an order for a custom tie. The giveaway will go until Friday, December 3rd at 11:59pm est. Each tie is made from an upholstery weight fabric, with a coordinating lining. Each tie is 90% hand sewn. The ties are tied onto a neckband and the neckband closure is velcro. The price for each tie is $15.00. Shipping is $2.00 flat for any amount of ties. Your Little Man being the most handsome boy ever: Priceless. You can choose any pattern, any size. If you are interested in placing a custom order email me at rissa80@gmail.com. In that email we will discuss payment options. If an order is place before December 10th I should be able to get them to you before Christmas. So for both the giveaway and custom orders, these are the patterns I am offering. The availability is first come first serve and subject to change, disappearance, or availability again later. I will also be making ties to stock up on for the opening of my shop. PLUS I am working on getting a version of this ready for the shop too. Good luck for the giveaway and I am excited to start some custom orders. Green & Blue Paisley...and orange quaterfoil...wow, I love all these ties! My 2 boys would wear them to church and look so studly! Thanks for the giveaway! These ties are so cute! I'm having a boy this month and these would be perfect for when he is older. I really love the brown and seafoam quatrefoil and the houndstooth. What a great giveaway and what beautiful ties. How cute! I love the yellow and blue rings and the green and blue paisley! I can just picture my two adorable nephews wearing them to church and for family pictures!!!! I am so so so beyond proud of you and so happy that you have opened your shop! Your ties are beautiful and I loooove them!! Nice work and I cannot wait to see all of your stuff! Lots of love! Little Professor Houndstooth and the seafoam quatrefoil and the cutest! This would be perfect for pictures and church! Green and Blue Paisley & Navy Flower Paisley. Adorable ties! My boys would wear them to Grandma's house and to their sisters' orchestra concert. Sure, a follower for quite a while now! My little man would look so darling in these!! He totally needs them for church! I'd love the orange quatrefoil and the houndstooth, but honestly wouldn't even care...they're all awesome choices! I love the little professional hounds tooth and the brown and seafoam quatrefoil. My little man would wear it to church and probably for family pictures if we ever get around to it. those are adorable! wish I had a little boy to put one on! Larissa! These are awesome! I love the little professor houndstooth. And my little dudes would where these everywhere, whether they like it or not! I like all of the patterns, But the ones that would match my son's shirts are the brown & seafoam quatrefoil and the yellow & blue rings. Adorable! 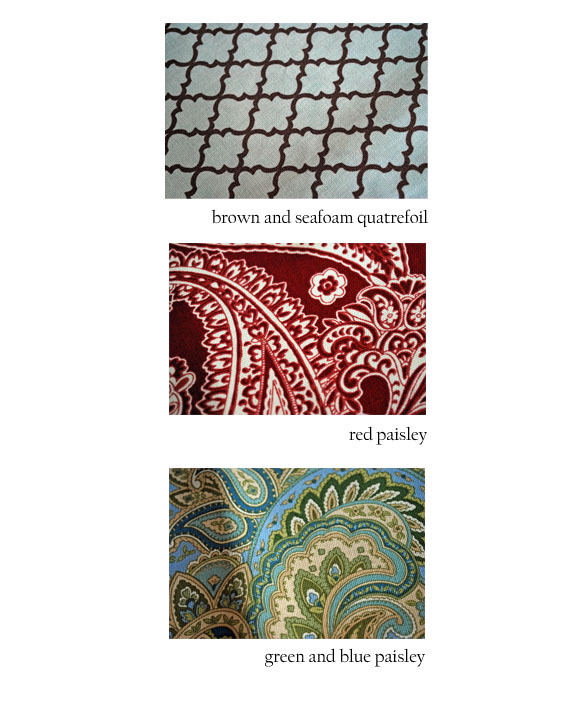 I would pick the blue and white quatrefoil and the green and blue paisley ties. We want navy paisley and green&blue rings ties to wear to grandma & grandpas house! And I follow your blog because I love it! I like the Navy flower paisley and the Little Professor Houndstooth and my little guy would look so handsome wearing them to church and for family pics. Follow Just Another Day In Paradise. 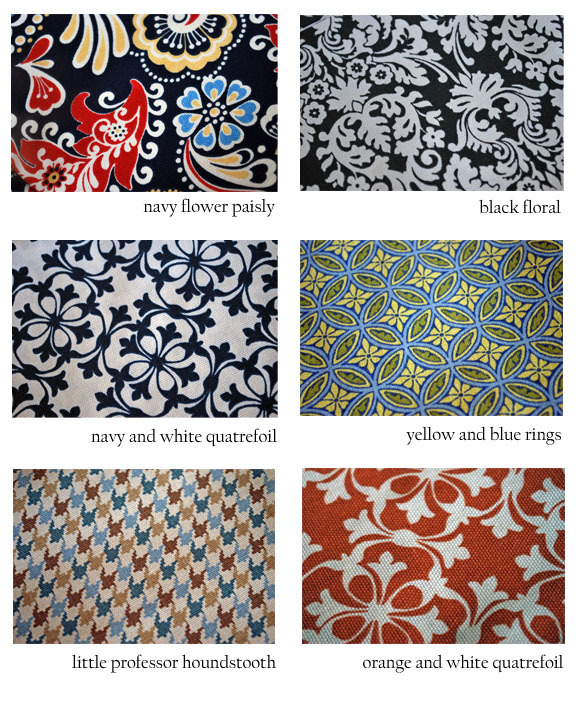 I'd go for Navy and white quatrefoil. They are look great!! So hard to choose. What a great giveaway! My little man could use some some ties! I love the orange and white quatrefoil and also the brown and seafoam quatrefoil. I would choose the yellow and blue rings and the brown and seafoam patterns - the boy would wear them to church and out to dinner and to visit Santa for pictures! thanks! I really like the orange and white and my little man would wear it to church or dress up a pair of jeans while hanging out. I follow and am so glad that I do! I love the green and blue paisley and the little professor houndstooth. My little guy would wear them to church and to get-togethers with friends/family. I LOVE your little man ties!! My favorites are the little professor houndstooth and the brown and seafoam quatrefoil. They are all so cute. I especially love the orange and white quatrefoil and the little professor! i Like the orange and white and the navy floral. SO CUTE! Oooo! I love the Orange & white quatrefoil! I've got 3 boys so they'd have to duke it out to see who gets to wear it to church! I am a follower for sure! I love these ties and saw my Friend Ali's little guy wearing one of your creations, ADORABLE! I love the blue and green paisley as well as the little professor houndstooth. They would definety be worn to church and to special events/holidays for sure! Thanks so much for the chance to win! Oh bummer... I missed the giveaway. I love the green and blue paisley! Also, I can totally picture my boy in the houndstooth--so cute!